With modern cleaning solutions like the Opti-Free RepleniSH, cleaning does not need time-consuming rubbing. Review Opti-Free RepleniSH Duo Pack Excellent value for money. Could be better with a couple more lenses holder. Review Opti-Free RepleniSH Duo Pack Excellent value for money. I know longer buy it as I now use daily lenses. Review Opti-Free RepleniSH Duo Pack I've been happily using this product for many years. Review Opti-Free RepleniSH Duo Pack Really good Liquid! Review Opti-Free RepleniSH Duo Pack This works perfectly for me. Review Opti-Free RepleniSH Duo Pack I have used this product since it was first introduced and find it looks after my lenses perfectly. Review Opti-Free RepleniSH Duo Pack Great product, great value for money. Really helps with dry eyes - definitely recommend. Review Opti-Free RepleniSH Duo Pack Good value for money. Review Opti-Free RepleniSH Duo Pack Seems to suit me as my eyes have been really sensitive recently. Review Opti-Free RepleniSH Duo Pack This is a great product that I have been using for some years now. It is very easy with a 'no rub' formula and I do not have any problem with protein build up that I did have with other products. The only down side is that the twin pack is a 3 month supply but you only get two lens cases. Review Opti-Free RepleniSH Duo Pack This is the only product i buy for storing and cleaning my lenses found other solutions do not match up to this product and this was also recommended by my optician as the best to use. Review Opti-Free RepleniSH Duo Pack I didn't have any trouble with this solution, and comfort was good, but it's a bit too expensive. Review Opti-Free RepleniSH Duo Pack Best solution I have used. It does allow longer use of lenses without drying out. Review Opti-Free RepleniSH Duo Pack Excellent solution as recomended by my optician. The solution is better than the Express version of this product as its designed for longer-use contact lense wearers. I've been using Opti-Free solutions for over ten years with no problems. Only downside is you get two lense cases instead of three, so value for money is not as good as Express version, as you inevitably have to buy one more case towards the end of the supply. Review Opti-Free RepleniSH Duo Pack Cleans very well and keeps the lenses soft for longer. Review Opti-Free RepleniSH Duo Pack Had a problem with lenses drying out and this really helped. Service and general communications ( emails informing about order receipt, despatch etc ) excellent, and next day service true to promise. 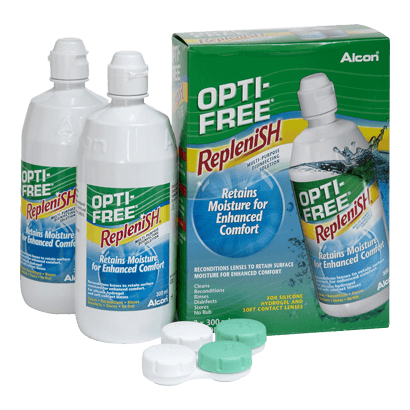 Opti-Free RepleniSH Duo Pack My optician recommended this solution and I'm very happy with it. It's really easy to clean my lenses with it. Review Opti-Free RepleniSH Duo Pack I was recommended this solution a few years ago and haven't changed. It maybe more expensive than other solutions but it lasts ages and the difference I found was extended wear, less dry eye and the lenses feeling more comfortable. does what it's meant to Great solution, I don't need to use drops half way through the day with this. Really is the best solution I've ever tried my only problem is the pack is supposed to last 3 months but it's impossible to make it last that long and I only wear contacts when I'm at work (4 days per week) One bottle just about lasts 2 weeks! Reliable Used to use Complete but advised by optician to change. Better than Express Replaced standard Opti-Free, seems to give more comfortable wear. Happy customer Little fuss and bother, no adverse impact on my eyes. Something else would have to be almost out of this world for me to change. One of the most inconvenient things about contact lenses can be the need to rub them clean after use, which takes up time and risks damaging the lens. With modern cleaning solutions like the Opti-Free RepleniSH, cleaning does not need time-consuming rubbing. Using the Opti-Free cleaning solution also has the added bonus of providing extra moisture when wearing lenses because the surface retains tear fluid far longer than with other cleaning products. The added moisture provided by the Opti-Free RepleniSH can allow wearers to keep lenses in for 6 hours longer than with other products, providing crystal clear vision even at the end of the day. This cleaning solution also provides unbeatable protection against dirt and germs with a powerful disinfectant component. It is also specially formulated to be effective on even the softest contact lenses.